On May 27, the U.S. Food and Drug Administration (FDA) announced the approval of Zinbryta (daclizumab) for relapsing multiple sclerosis. 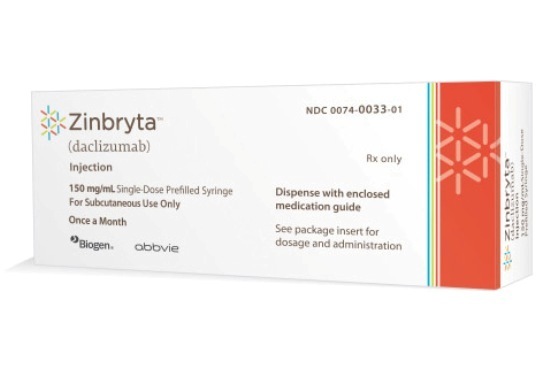 Zinbryta is a monthly, long-acting, self-administered injection. Zinbryta has a boxed warning and is only available through the Risk Evaluation and Mitigation Strategy program. In one clinical trial, in comparison with Avonex, 1,841 participants over 144 weeks experienced fewer relapses on Zinbryta. In a second clinical trial, 412 participants over 52 weeks were treated with Zinbryta or a placebo. Participants receiving Zinbryta experienced fewer relapses than those on the placebo.